1869. 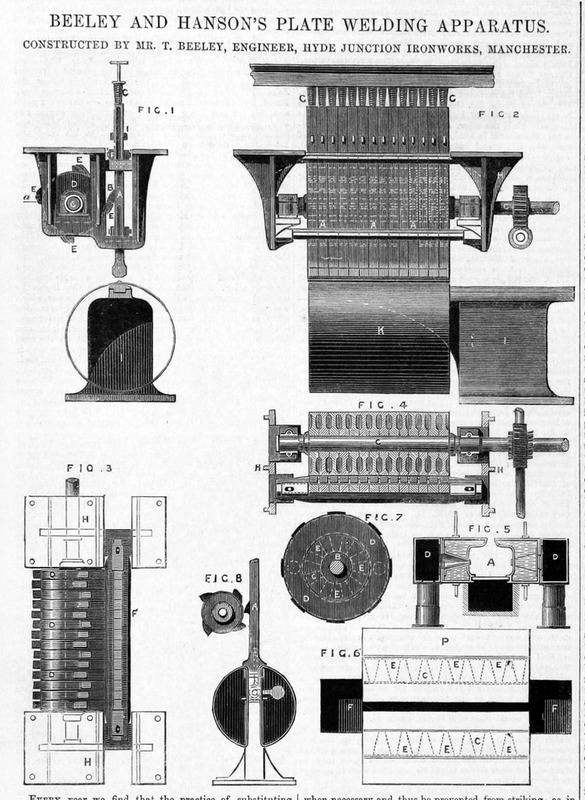 Beeley and Hanson's Plate Welding Apparatus. 1871 Living at West End Villas, Newton, Cheshire: Thomas Beeley (age 37 born Hayfield), Master Engineer (Employing 130 men and boys). With his wife Elizabeth Beeley (age 40 born (? ), Yorkshire) and their children Elizabeth Edith Beeley (age 4 born Newton); and Thomas Beeley (age 1 born Newton). One servant. THOMAS BEELEY was born at Little Hayfield, near Hayfield, Derbyshire, on 27th October 1833. Upon leaving school he was first employed as a cloth-looker in the cotton mill of the late Mr. Marlor at Newton, near Manchester, and at the age of eighteen he entered the works of Messrs. Daniel Adamson and Co., at Newton. Beginning as a time-keeper, he worked himself up to the position of general manager, and remained in that capacity until he started in business for himself in 1867 at the Hyde Junction Iron Works. From that time up to his death he was constantly at the works, and the whole of his engineering activities were confined to the development of land-boilers and to the conduct and increase of the works. He was connected with the late [William Fairbairn|Sir William Fairbairn]] in improvements in the Fairbairn type of boiler, adding to it a nest of tubes at the back of the flue and other small alterations, which resulted in the successful and economical Fairbairn-Beeley boiler. He was very closely associated with the proposals for the experimental boiler burstings during 1874 to 1876, which were undertaken at his works, under the instructions of the Manchester Steam Users' Association, to determine strengths of the various parts of an ordinary Lancashire boiler. His numerous inventions were connected with small details in the construction of boilers, and particularly with machinery for their manufacture. He was much interested in the early development of superheating, of which he was the maker of several types. He also made a great success of the three-flued boiler. For thirty-five years from the commencement of business he never advertised or exhibited or had any representatives. Notwithstanding this, his business judgment and engineering ability inspired the confidence of the profession as well as the public, including many of the large engineering firms of the country, and the Government departments. He kept in a remarkable degree in his older years the willingness and ability to look ahead which had characterised his younger days, and he was just as ready to install now plant as at any period of his career. About 1898 he commenced to leave control of the business to his son, Mr. T. Carter Beeley, and devoted more time to public work. For some years he had been a member of the Hyde Local Board, which was dissolved in 1881 on the incorporation of the town, and was its last chairman. He had lived both at Ashton-under-Lyne and at Dukinfield, and for many years he was a member of the Dukinfield Local Board. During his residence there he became a member of the Cheshire County Council, and was subsequently an alderman, having for the last few years been vice-chairman of the Council. In 1883 he was appointed a magistrate for the County of Chester, and in 1906 he became Chairman of the Dukinfield Petty Sessional Division. For the last two years he had not enjoyed robust health, having suffered from weakness of the heart. Having gone to Blackpool to recuperate, he succumbed to a heart seizure on 5th June 1908, in his seventy-fifth year. He became a Member of this Institution in 1875. This page was last edited on 23 June 2014, at 11:49.